I have to be honest, I’ve never been overly concerned about what was in disinfecting agents or cleaners. As long as they did the job and made my house smell clean I didn’t care much about what they may possibly contain in terms of anything hazardous. Things have changed though since having our daughter last year,especially now that she’s crawling and getting into everything. I’m more aware than ever about the chemicals I use in my home. Our nine month old’s favorite thing to do is pull herself up and practice standing. While watching her pull herself up this weekend, using the newly cleaned glass-top coffee table as leverage, I noticed she was also putting her mouth around the edge of the table. Forget that it wasn’t the safest thing for her to be doing, just minutes before, I had cleaned the table using a regular brand named glass cleaner. Though the table was dry, there’s no doubt in my mind she consumed some yucky and potentially dangerous chemicals by licking the table. Even the most attentive parents will tell your their kids get into stuff they shouldn’t. It got me thinking about having to lock our cleaning supplies up. While it is important to start child-proofing my home, I have decided to start making my own cleaning supplies, packaged clean-scent be damned. To ‘make’ my own cleaning supplies, I will be using a combination of these ingredients. All recipes compliment of a phone call to my aunt, the green-cleaning queen! A combination of these simple ingredients will clean almost every surface of your home and contain no harsh chemicals. Though it may not taste very good, if your child or pet gets into these supplies they won’t be harmed. A diluted mixture of water and vinegar (equal parts of each) makes a safe surface cleaner and disinfects! Once the surface dries the vinegar smell goes away. If you have extra tough grim to get off, a mixture of baking soda and water or baking soda and dish soap will cut through it easily since baking soda is an abrasive. Approximately six tablespoons of baking soda to every one to two tablespoons of water or soap, whichever you use. Vinegar and hot water can be used to clean hard-surfaced floors as well. 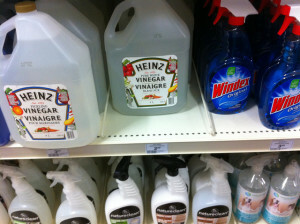 Approximately one cup of vinegar for every gallon of water. Baking soda and dish soap mixture is great for cleaning both ovens and microwaves as well. To clean and disinfect your toilets, pour full strength vinegar in the bowl, scrub with brush, leave sit for a few minutes (15-20) and flush! Scrub the bathtub soap scum away with baking soda and water (or dish soap) paste mixture. To freshen carpets pour baking soda into the carpet, let sit at least one hour, though ideally overnight, and vacuum up. I don’t know why I waited so long to come to this decision. Not only is it safer for my whole family (pets included!) I’m sure to save a few hundred a year not buying fancy nice-smelling, commercial cleaners. Do you make your own household cleaners for spring cleaning? Any tips for a beginner?